Philadelphia Union sent $300,000 of General Allocation Money and $900,000 of Targeted Allocation Money to Chicago Fire in exchange for winger David Accam on Friday. “Today’s acquisition of David Accam marks an exciting moment for our club, and we are thrilled to welcome him to the Philadelphia Union. David possesses electrifying speed and skill to go along with a nose for goal comparable to the very best in MLS. We believe him to be a perfect fit as we continue to build our attacking corps. He provides an instant boost on the wing and we look forward to integrating him with our team as soon as possible,” Sporting Director Earnie Stewart said after the deal was announced. 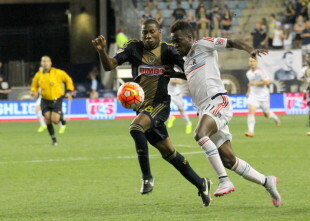 Accam scored 14 goals and added eight assists for the Fire in 2017 and will take up a Designated Player spot on the Union’s roster. However, Accam has had a green card since 2015 and will not take up an international slot for Philly. Although Accam’s emergence as a goal scoring force with a creative side helped elevate Chicago into the playoffs for the first time in five years, the winger was “disappointed” to be left off the All-Star roster by Fire head coach Veljko Paunovic. Notably, the 2017 All-Star game was played at Soldier Field in Chicago. The consistency of Accam’s production during his three seasons with the Fire stands out on a Union roster that has seen substantial variability in production from its front three positions during Jim Curtin’s tenure. The Ghanaian reached double-digits in goals in 2015 and 2017, and he secured nine goals and five assists in less than 2000 minutes in 2016 on a very poor Fire side. Alongside Fafa Picault and CJ Sapong, Accam provides the Union with an incredibly quick attack that can latch onto early throughballs from Haris Medunjanin. Accam represents the first major roster addition for Philadelphia during the 2017-18 offseason, with previous new arrivals coming from the academy. This is a serious upgrade. No more discussions of Herbers or Ilsinho on the outside. They can be our subs, where they belong. Fafa and Accam on the wings will give defenders nightmares. This is a very, very good start. He’s a perfect fit for CJ and our attack. We now need a big time 10 and maybe a reasonably priced veteran CB and we’ll be set to have a good year! Keep in mind Sugarman spent $0.00 out of his own pocket for this acquisition. That’s okay though. If we can make good, smart moves with funny money I’m all for it. I don’t think we’ll be getting a big time number 10 personally. Probably they’ll play Najem at CAM and rely primarily on early through balls and speed rather than play making creativity. I’m not saying I agree or disagree just saying what is likely to happen. Ilsinho will most likely be shoe horned into the 10 spot again. Please no Jbh. We’ve seen enough of last year. Curtin said the team is “absolutely” still searching for a 10. So, this could all turn around in a hurry. This should be a perfect fit. A DP 10 and veteran CB, and I’d be satisfied with the first XI. Earnie’s comments make it clear that they are not in a hurry for a CB. I’m guessing they will push forward with the young guys. But they have addressed the wing and LB (if Real pans out). We’ll wait on the 10 to see what they can pull off. I’m fine with the young CB’s, too. I probably didn’t need to add that in the original comment. Gooch worked well, but I think Richie and Jack should be just fine, especially with Andre still in goal. Then with Yaro, Trusty, and McKenzie, there’s still plenty of depth or assets to flip into another MLS veteran, if needed. A quality move and biz in league. Nice. Now all we need is a $1 million+ CAM and a manager willing to push CJ, Accam and Fafa up in a 4-3-3. Gegenpressing, heavy metal football. Spoken like a true Liverpool fan! I give them credit. Bold move for a proven player in MLS in his prime. Nicely done. I don’t mind the wait since the move has been completed before camp. We really need to stop signing players after camp starts (unless they are trialists). As one who is often critical, I like this move. Definite upgrade and a true moneyball acquisitions. Now let’s see what they spend on. Love the move. But he is on last year of contract and was refusing to re-sign with Chicago. Re-sign him, and this is wonderful, fail to re-sign him and you paid a million for a rental…. I’m sure they are aware of that, and that if they don’t resign him that they will be the ridicule of the entire league. I’m guessing they had something ready to work out with him and he will be officially signed to an extension pretty soon. I’d expect a Bedoya-like salary for him. Somewhere around $1M/year. Hahaha, I’m sure they are aware of it as well. He’s on 750K/yr now, so you’re probably right about the salary range. We put most of our eggs in the Accam basket, But damn we might have some offence going on this year. If we get a 10 I’ll be content. We had 2 massive starting holes on this roster. RW and CAM. The way the league is setup, you have to put a lot of eggs in starting spots or else you end up with a bunch a below average starters and above average depth that gets you nowhere (see last years Union). Did we overpay? Top pick was 200K yesterday. Good first step, but there is a lot to do between now and camp opening. This most resembles my opinion. Some hope may be creeping back in that Stewart has learned the league and is taking advantage of it this year. It’s an upgrade but still not the position most in need. How does sending all that funny money to Chicago affect the Union salary cap wise and their ability to sign Neymar (or other quality 10). Doesn’t affect the salary cap at all because it was the equivalent of a transfer fee, more or less. Accam is a DP, so his cap hit will be whatever the DP cap hit turns out to be for 2018, minus what ever other funny money they use to buy down his contract. Dan C above says his salary is about 750K. That’s about what Mo Edu was getting if I remember correctly. This is a great move. Fafa and Accam on the outside open up major space in the middle. Hopefully, 2 more moves on the way. hard to argue with this little piece of business. They now would seem to have a surfeit of reserve flank midfielders. Finally some positive banter coming out of Chester. Like the move, don’t love it. Too much money. I personally would have traded up to draft Atuahene for alot less. I really think Atuahene will pan out and be an Accam type player. With Accam and #10, I’m not convinced they are a playoff team, Curtain is still the coach. in my opinion, the talk about a defensive need is correct, but it is not at center back. It is at left back. Matt Real is 18 years old and has only 19 professional starts under his belt. They gave Trusty another full year of USL games while he was practicing every day with the Union. Matt deserves the same chance. Why would you expect them to do anything less developmentally with Real than what they did with Trusty? Paul Tenorio has tweeted further details about the terms covering future developments with David Accam. see Twitter link above labelled “interesting”. If the Union sell him on this season, Chicago gets 90% of the proceeds, he claims. And what he presents extends into 2019 and 2020. That suggests an expectation of Accam stay9ng with Philly. DP spot and salary are a swap with the Edu albatross. Can always buy that down to below DP. Frankly, it’s a great move. Basically Earnie said “IDGAF” about the asset values for things like the sell on value or the GAM/TAM split over the next two seasons. He acquired a + player that’s pretty much budget neutral to Edu and used about what the league increased his AM with AND has yet to touch whatever money Sugarman can be parted from. Now the reality is, Accam is probably worth like 5 points in the standings over Pontius. The backline is going to end up +/- 1-2 points depending on Gooch’s replacement. So…theyre still not a playoff team at 46-49. Shooting the wad on a $500k + CAM would probably get them to 50-52 and right in the mix for 5-6th. finally ……… almost there now add a quality number 10 and an upgrade at left back and center back and the union can compete with just about anybody. This was a good move. We were in desperate need of a winger. Having said that. Curtin is still the coach and I’m not happy about that. We all have good reason not to be. For example, the Alberg situation. He could have been one of the top forwards in the league. He was not a #10. His awareness was poor and he did not move enough and he found himself lost in games. Having said that. He had the best striking ability on the union and and maybe one of the best in the league. My point is he should have been a forward on the U with sapong. Running with two uptop. I think this would have changed the outcome of the team. They never played Davies either. I’ll give them a break being that he had health issues but, they never implimented him into the squadron healthy, to implement a player who had an excellent record and was an established forward in the MLS. So, I’m happy with this signing but we’ll see what comes of it coaching wise.